As temperatures rise, producers may need to pay closer attention to their synchronization programs. Working cattle in hot weather can be detrimental to heat synchronization and artificial insemination (AI) programs, says Julie Walker, beef specialist for South Dakota State University (SDSU). When cattle need to be moved or worked, it pays to watch weather forecasts and try to choose a day that won’t be during a heat wave. Sometimes, however, producers need to get cattle in for a heat-synchronization program, and timing is crucial, regardless of the weather. Walker says more producers are shifting to April-May calving to match forage with nutritional needs of the lactating cow and to reduce labor at calving to avoid having to worry about cold weather in February-March. Now, she says, they have to deal with the heat instead. This can translate to more time and labor, particularly if cattle are away from AI facilities, she says. “If the cattle are not very close to the corrals, and we have to pull CIDRs at 7, this might mean we have to go get the cattle at 4 or 5 p.m., and that’s still during the hottest part of the day. We won’t be able to give them any time to rest and cool down and rehydrate because we have to sort off the calves before we put the cow through the chute. This often equates to 3 hours of working those cattle in the heat of the day,” she says. Think about the heat and plan ahead, Walker urges. Consider moving cattle closer to the corrals in the morning while it’s still cool. That way, cattle are refreshed and watered before being worked, and maybe moving them will take less time. When moving and working cattle that time of year, make sure there is ample clean fresh water for them, so they won’t have any hesitation about drinking and getting rehydrated, she says. If you’re using a fountain-type tank, make sure there’s enough water pressure to keep it full, Walker says, and make sure calves can reach the water. Producers should also take into consideration that if you are doing heat detection during hot weather, cows won’t be very active during the heat of the day; they will be lying around in the shade to stay cool. You’ll have your best luck checking cows early in the morning or late in the evening, Walker notes, and they may be most active at night. When was the last time you thought about HOW MUCH water your cattle need on a daily basis? You might be surprised about how much this need increases during the summer months. Mature, lactating cows can consume more than 20 gallons of water per day during hot weather. Check water sources often to make sure an adequate supply of clean water is available to animals. Providing easy access to a quality water source is important in maintaining adequate water intake and animal health. Fly populations begin to increase during the summer months, and control and prevention programs are necessary. One of the most common fly problems in the Southeast is associated with the horn fly. It is estimated that the horn fly causes close to $800 million in economic losses nationwide to cattlemen every year. Horn flies can cause significant blood loss and change animal behavior. Cattle begin to alter grazing patterns, gather in groups, and may have significant energy losses associated with battling horn flies. Reduced energy can often mean decreased milk production and calf weaning weights. 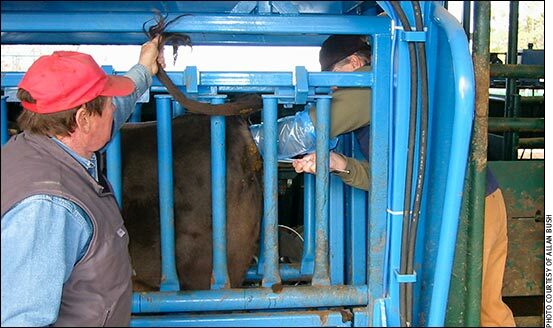 There are several prevention options available for fly control in beef cattle. Whether it is ear tags, sprays, dust bags, etc., the most effective fly control programs rotate between products containing different chemical classes to prevent resistance. Resistance occurs when a product is highly effective at controlling flies for a given period, but then quickly becomes ineffective. Using products with the same active ingredient for an extended period of time decreases fly control effectiveness. In order to decrease resistance, rotating between pyrethroid and organophosphate-containing products is recommended. If insecticide-containing ear tags are used as a control method, a 4-year tag rotation system is suggested. For example, a tag containing organophosphates is used for the first two years, followed by a pyrethroid tag in the third year, and then an organophosphate tag in the fourth year. The use of a pyrethroid tag for more than two years in such a rotation is not recommended. Remove tags at the end of the season to prevent flies from being exposed to low levels of insecticide that can lead to resistance. In the case of horn flies, do not begin to treat cattle until flies exceed the threshold of 200 flies per animal. At this point, it becomes economically advantageous to treat animals and the chance for insecticide resistance is decreased. As always, it is important to follow the label directions for animal health products for them to be used safely and effectively. For more information on fly control, refer to publication ANR-2083 Fly Control for Alabama Cattle Operations. Planning your stored feed needs for this winter can never start too early. We are in the midst of the hay-making season, and many of you may have already put up an ample supply for the winter if. Certainly Mother Nature can be our friend or foe during this time of year when it comes to the hay business, but forage maturity at harvest is extremely important for producing high-quality hay. Conduct a forage analysis to know if supplementation will be needed this winter to meet animal nutrient requirements. Supplemental feed prices are generally quite high in the winter months, and it is advantageous to plan now for expected feed needs when a lower price point may be observed. The lowest prices of commonly used sources such as corn gluten feed and soyhulls are usually seen from early May to early July. After this, prices begin to increase through the winter months. The best way to save on feed costs is to watch prices and have an adequate storage facility to capitalize on low prices and store feed until your time of need. June 3, 2015, Dr. Kim Mullenix on the SE Cattle Advisor website.